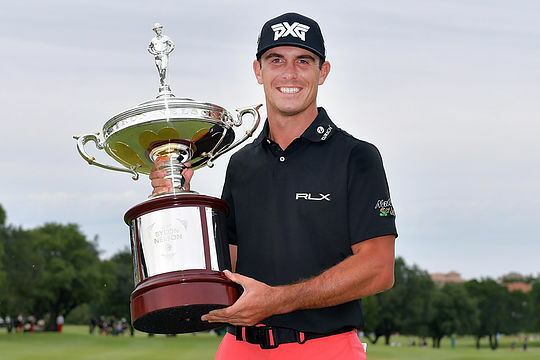 Billy Horschel won on the PGA Tour for the first time in nearly three years on Sunday when he took the Byron Nelson Championship in a playoff over Jason Day for the fourth PGA Tour title in his career. Horschel shot a 69 to Day’s 68 to get into the playoff as the pair finished at 12-under and watched on as Day missed a 4-foot putt for par that would have sent the tournament to a second playoff hole. The victory was the first for Horschel since he went on a stellar run in the 2014 FedExCup Playoffs and took home the Tour Championship. Since that time, Horschel has just nine top 10s in 63 events and came into this week’s Nelson having missed his last four cuts in a row. It looked like Horschel was beginning to fade during the early stages of the back nine as he posted back-to-back bogeys starting at No. 12, but he bounced back with an outstanding birdie at No. 14 to get back level. Day responded with a miraculous birdie of his own. The 29-year-old Aussie found the deep rough off the tee and his approach came up well short of the green. He faced a long chip from a downslope across a bunker and delivered a perfect shot to save par which ultimately proceeded along with the two horse race for the title. Both made par on the 17th before leaving birdie chances short on the 18th to set up the play-off. Earlier Day had a one-shot lead with three holes to play. Day’s playoff loss, while disappointing, moved him up to 39th in the FedExCup race. He also reclaimed his No. 3 spot in the Official World Golf Ranking, ahead of Hideki Matsuyama and narrowly missed overtaking Rory McIlroy. The result was Day’s best finish this season having suffered a back injury last year, and he has only managed one top-10 finish since. Marc Leishman was the next best Aussie closing with an impressive 67 to finish in a tie for 13th position along with world number 1 Dustin Johnson. Rod Pampling also made the cut but a closing round 75 saw him drop 23 places to finish in a tie for 59th position. Geoff Ogilvy and Greg Chalmers also made the weekend.